My name is Aly, and I’m proud and honored to write a blog for Hadassah’s websites. I hope that my regular updates can help to give you an insight into what truly makes Hadassah Hospital tick . . . the building, the patients, and the wonderful staff who fill it day and night. Just a little about me: I am 53 years old and my family and I made Aliyah nearly 18 months ago. Around four years ago, while living in the United Kingdom, I received a “double diagnosis” after having an MRI: multiple sclerosis (MS) and a brain tumor. The tumor, due to its shape, size, and type, is inoperable, and I was always warned that at some stage, it may change and need further treatment. In the meantime, for the past four years, I have used injections three times a week to control the MS and stop any further deterioration. Having planned our Aliyah for nearly 24 years, and with the tumor not showing any significant change, we finally fulfilled our dream of moving to Israel in May 2015. Unfortunately, the tumor showed some signs of growth and change in behavior and, after a biopsy earlier this year, I am now part way through a course of chemotherapy–following a six-week intensive course of radiotherapy earlier this year. Patients with the two conditions combined are not common, but the professors treating me keep themselves at the forefront of research and I am confident that together we will beat this! It is difficult to put into words to those who have not yet had the opportunity to visit, what a truly overwhelming complex Hadassah Hospital Ein Kerem is part of; it looks down over Jerusalem from the top of a hill and, although the road up is windy (and in common with most other roads in Israel, driven at twice the speed that perhaps it ought! ), there is such beauty in the surrounding landscape that no matter how anxious you may be feeling, you somehow experience a combined sense of peace and belonging. 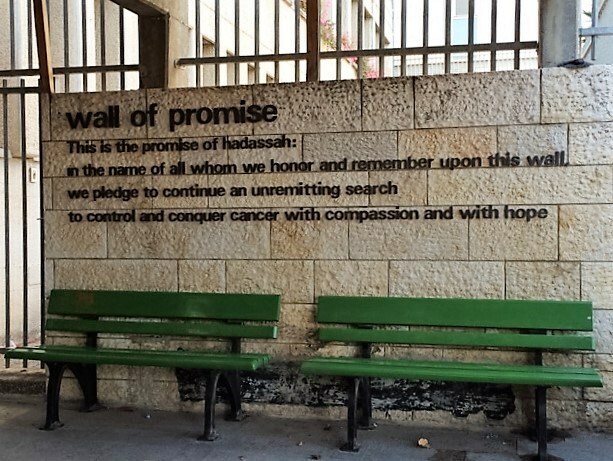 I have sat on the benches you see in the picture and used the time to truly appreciate the hospital, the care, living in Israel, and just life in general. I have also cried on those benches and got to chatting with other patients and visitors. I begin with the radiology department, since my first intense exposure to the hospital was via this department. I had a daily appointment for seven a.m. and tended to see the same patients each morning. We chatted about treatment, compared conditions, and shared cake on my birthday! On my first visit, I was introduced to Ruth, a Canadian nurse who gently explained what was to come, the symptoms I may experience. She showed me how to tie a headscarf to cover my hair loss and to protect my head, talked to me about looking after my body both internally and externally, and truly helped to humanize the hospital and allay many of my fears and concerns. When I have bumped into her since, she has always greeted me with a gentle gesture, a small piece of advice or just a smile and greeting by name–a great unsung hero. Another unsung hero from the same department is the guy who cleans the public areas. When he realized I was visiting daily and always needed to fill my water bottle at a certain time, he changed his routine to be sure the fresh water would be topped up in time for me. We didn’t communicate verbally–he spoke only Arabic–but with “sign language,” I was able to thank him and show him I appreciated his gesture. I am just now sitting in the waiting room of the Neuro-Oncology Department, waiting to see my neuro-oncologist. I’m hoping I’ll get the go-ahead to restart chemotherapy later this month and if not, that we can discuss other options. Whichever way it goes, I know that the patient-centered and well-researched decision will be made with my best interests at heart.